The past 14 months have been nothing short of stellar for Chloé Dygert Owen. 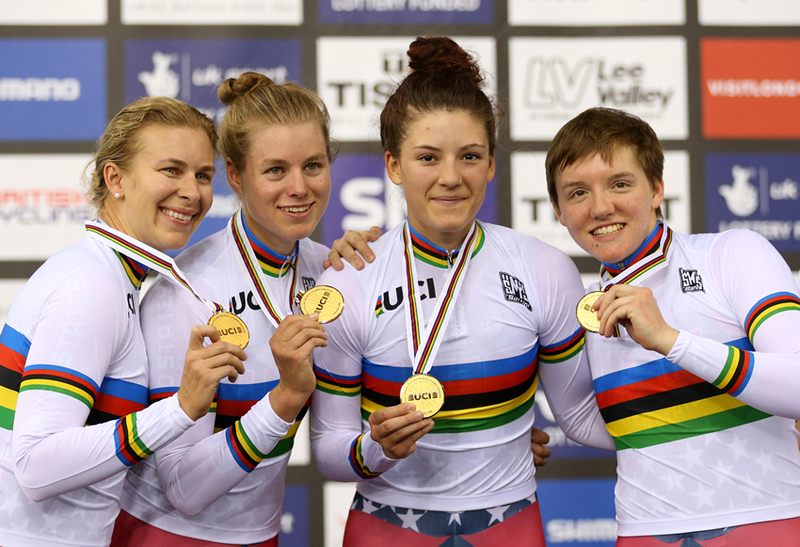 Two junior world titles on the road in 2015, elite team pursuit world title on the track in 2016. Followed by an Olympic debut at 19 where she claimed silver in the team pursuit. Heading in to 2017 the 19-year-old shows no signs of slowing down and has set her eye on new and ambitious goals for 2017 on both the road and the track. With the individual pursuit world title high on her list of objectives as she keeps an eye on the world record as well. Dygert Owen's success is all the more remarkable when considering just over two years ago she was recovering from her second reconstructive surgery and a torn ACL. "It was crazy to think just over two years ago I blew out my knee and had to have reconstructive surgery, I never thought in a million years I would ever recover to cycle at the junior level, let alone the pro level! "It has been a blessing to be back and have accomplished what I have. All glory to God." Her first taste of the Olympics might have come earlier than anticipated for many but something Dygert Owen knew was possible after testing on the track in the second half of 2015. "When I was asked to be a part of the track program I knew that if I was good enough I would have the opportunity to go to the Games. "I didn't know what to expect out of a team event but I assumed having Sarah [Hammer], we must be medal capable. Having continually set some of the fastest times and as the reigning World Champion Dygert Owen's maturity shone through not letting the pressure of competing on the biggest sporting stage in the world get to her. "Going into Rio I felt calm and prepared. "There is so much more to focus on than the opponent, I can tell you I don't even give them a second thought until I hear the bell for the final lap," she said of the final four kilometre pursuit against Great Britain. "I focus on my pulls and recovery; I don't hear anything but my breath and the sound of our tires on the track. "It was a very special moment for all of us. Of course we wanted gold, but it was still amazing to have won silver with the team and for my first Games!" The past few months since Rio have been an opportunity for Dygert Owen to take a step back and have some time off the bike to recover and marry rising under 23 star Logan Owen last weekend. "It has been great to not have to do anything. I recently got married to Logan Owen, so it's been nice focusing on life without a bike for a few weeks." After a largely track focus around the Olympic Games in 2016, Dygert Owen will combine the two in 2017. "I plan on doing a little of both, with my focus being the ITT at Nationals and Worlds." On the track her focus had been the team pursuit but with a new Olympic cycle starting riders have the opportunity to branch out and set other targets. Dygert Owen's strength against the clock both on the road and the track makes the individual pursuit an appealing option. When asked if the individual pursuit is something she is looking at there was a quick answer. "For sure! "Sarah holds the world record in the IP and I do hope to someday break it," Dygert Owen explained on her longer term ambition of breaking the World Record held by Olympic and World Championship teammate Sarah Hammer. Hammer's time of three minutes and 22.269 seconds set back in 2010 at altitude in Aguascalientes has stood for over six years with so far nobody coming close to testing the mark. Australia's Rebecca Wiasak has claimed the last two world titles in the event but the rising American star adds her name to the list of riders eager to wrestle the title from her hands. The 2017 UCI Track World Championships in April present Dygert Owen her first goal of 2017 but the final round of the World Cup Series in Los Angeles will be her first stop. "I must first qualify in LA this year, but yes, it is one of my goals for 2017."